Have you ever thought about building a home? If you have you likely know you have multiple options when it comes to finding a lot. Your builder may suggest a community. But there’s another option! You can build on your own lot. 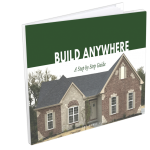 CMS Homes makes the process on building on your own lot easier than ever before with our special Build Anywhere Program and Easy Build Financing. We put this helpful guide together to walk you through the process of building a home where you want! Inside, you’ll learn each step required to build a home on your lot with CMS Homes. Fill out the form on this page to receive instant access to this helpful resource!